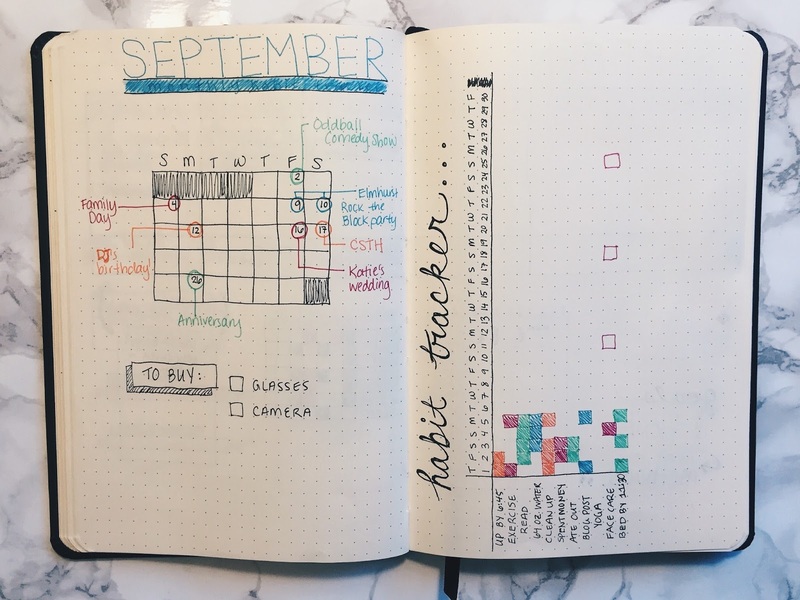 This is an update on my bullet journaling progress. You can read my first post here. 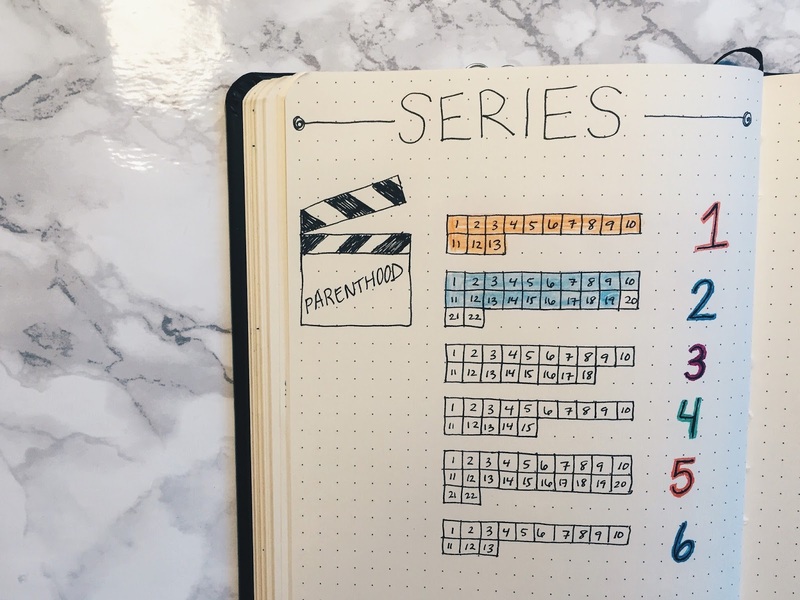 Back in May, I started bullet journaling, and have stuck with it for four months now. About half my journal is filled with appointments, tasks, quotes, trackers, reminders, doodles, and lists. Some pages have stayed the same, others have changed, a few are new altogether. Top pic, left side: My monthly overview is a page that I don't see ever being phased out. It's helpful for me to easily see what I have going on and when. I've enlarged it a bit since I first started, to keep the info more organized and less cluttered. I also will include any significant to-dos for that month. Top pic, right side/Bottom pic: This is my first go at a horizontal habit tracker. Until now, I used the same mini calendars, logging days I exercised, ate out, spent money, did yoga, and put up a blog post. 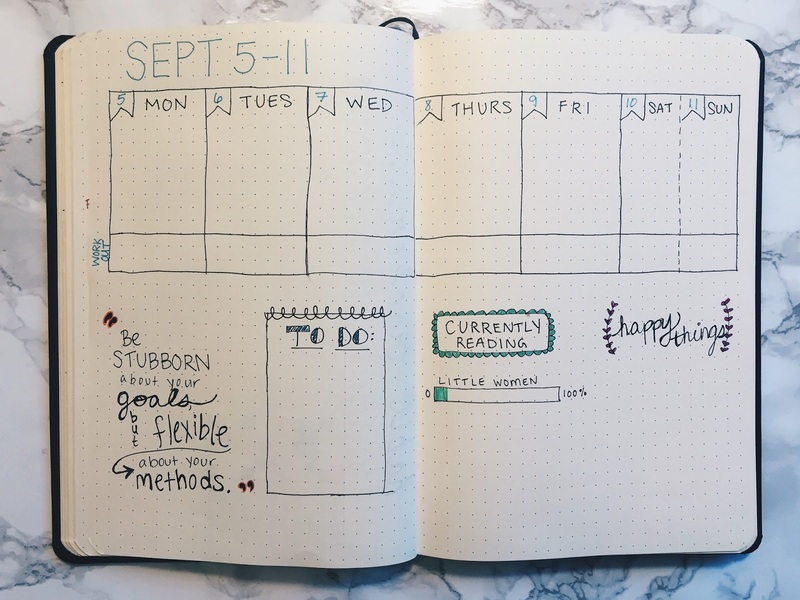 My reason for switching layouts is twofold: There were more habits that I wanted to track, and I didn't want them in the weekly spreads. So I'm trying this one out. I like having all trackers in one place, but I also feel like it will be more difficult to really gauge how many days I did whichever habit. If I do stick with this layout, one change I do want to make is separating them into "good" habits and "bad" habits. I've played around with a handful of different weekly set-ups, one of which involving an entire week condensed onto one page. The layout that I've settled on (for now) is actually very similar to the one I initially had, with a few extra tweaks. Top half: Stretching the week across both pages works best for me. I have enough room to log any tasks or appointments for the day, but it isn't so big that there'll be a bunch of white space if there isn't much to write. I've also tacked on a section to each day for workouts. I wanted these separated from the rest of the days' activities so it'd be easier to see at a glance how often I worked out. 2. Things to do that week. 3. What I'm currently reading and how far along I am. 4. A list of good things from the week to keep me positive and grateful. These are two new pages/lists I started. Left: I use this page to keep track of anything I've ordered online and when I can expect it. While I do save confirmation and shipping emails for online purchases, it's nice to have everything in one easy list. 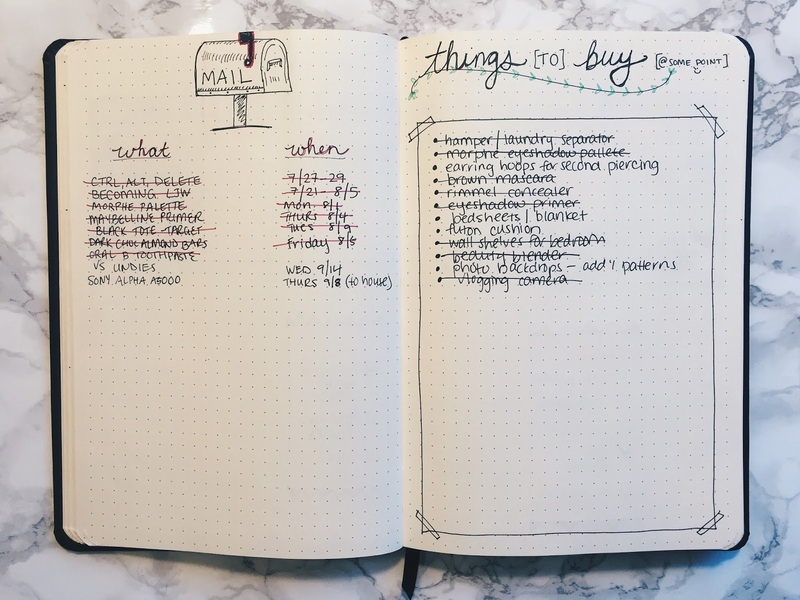 Right: Things I want to buy (aside from routine household items).